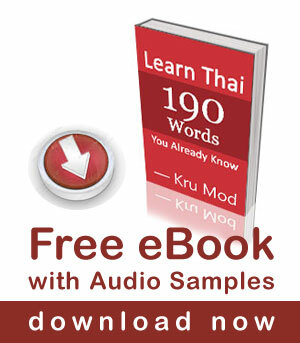 There are many ways to say good night in Thai. Below are expressions that are commonly used. Good night/ Have a nice dream. Hi Mod. Thankyou for lessons. I feel them helping a lot. I find myself going over and over in my mind while at work I shall visit Thaikand in ictober \ November and look foward to communicating in Thai. Well I shall try. Welcome to Thailand in advance, November is a good time to visit – the weather is cooler toward the end of the year. I watched a movie and I heard the characters has said,” Sawadee chaw” or something. Is this okay? By seeing the Thai word you wrote in English phonetic, I am not sure if it was “สวัสดีตอนเช้า sà-wàt-dii dtawn cháao” which means ‘good morning’ or “สวัสดีเจ้า sà-wàt-dii jâo” which means ‘hello’ in Northern Thai dialect. Wish you can upload many more useful videos! hi, thanks for your free lesson, can i know is there any place in your website teaching single word pronunciation? I just finished the book, “Dreaming in Hindi,” about what it is like for a westerner to acquire a second non-Romance language.” It is a fascinating book written by a woman (in her 40s) who spent a year in India learning Hindi. When i said Lap Hai Sabai to my Thai friend, They feel so weird !!! Because it mena RIP -.-! Suppose to be Non lap fan dii or Non lap fan wan. as usual an interesting lesson. slowly but surely my thai is improving… living here in Australia it is difficult sometimes to get the correct tones etc. your lessons are always fun to watch. keep up the good work!